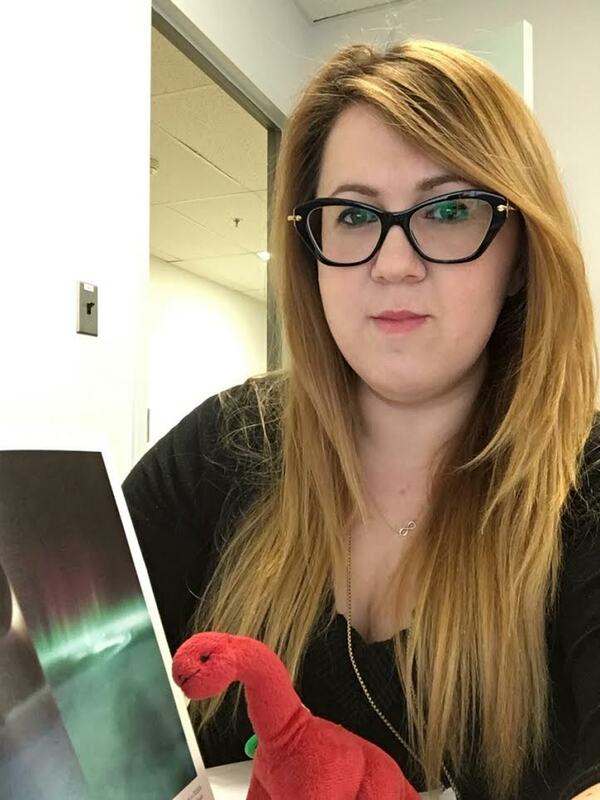 I am Burcu Kosar, an atmospheric scientist on the Aurorasaurus team. I studied the electrical connection between thunderstorms and the Earth’s upper atmosphere through computer modeling. Specifically, I studied sprites – brief flashes of light that are associated with lightning. I am applying my computational expertise from sprites to study auroras. Sprites are not too unlike auroras. Both are visually magnificent natural phenomena that can send shivers down your spine when you see them. I was first interested in sprites because of the way they looked — a surreal visual similar to an aurora. 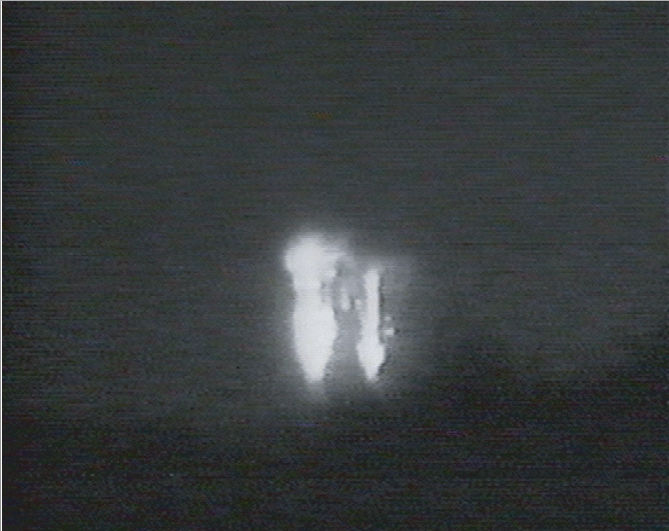 In the eye of an observer, sprites appear as a flicker of light above thunderclouds. They were actually mistakenly identified as unidentified flying objects (UFOs) by the airline pilots before their incidental discovery in 1989. When I first saw videos of sprites, I thought they looked like fireworks and I wanted to learn more about them. Sprites are important to study because they change the electrical properties in our atmosphere and can affect radio communication. Even though the physical processes leading to formation of sprites and auroras are different, both phenomena share the same home – the atmosphere. Auroras are generated through magnetic fields while sprites are sparked from electric fields. 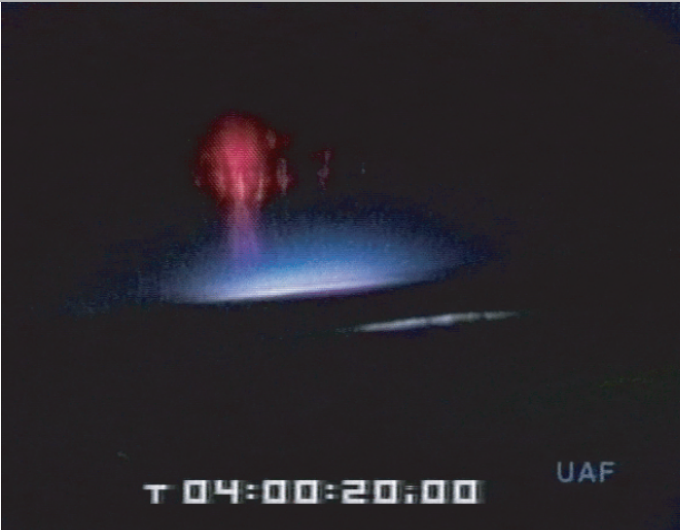 Sprites are large electrical breakdown of air initiating in the altitude range of 70-85 km. In the most general sense, “electrical breakdown” is the process of converting a non-conducting material (air) into a conductor as a result of applying a strong enough electric field to it. The electric field for sprite initiation is provided by the removal of charge from cloud-to-ground by the lightning flash. The electrical breakdown process involves many fundamental physical processes such as motion of an electron in the presence of an electric field and its collision with other particles in the atmosphere. These processes lead to formation of an electron avalanche. When the number of electrons in the avalanche reaches a threshold value, the avalanche continues its propagation as an ionization wave called a streamer. Streamer is the basis of a sprite. Sprites occur in the upper atmosphere, lower than where auroras occur and much higher than where airplanes fly. While auroras can be quite dynamic, sprites move faster – on the scale of milliseconds! Sprites move with speeds up to 5 x 107 meters per second — a fraction of the speed of light! Because of their extremely fast speeds, they’re very difficult to capture on camera, much harder to capture than the aurora. Take a look at this rare image taken over Minnesota in May 2013. It could be one of the very few images capturing the aurora, sprites and an active lightning storm together in the same frame hence making it my all time favorite by bringing my scientific interests together! I think the Earth’s atmosphere is a canvas through which nature displays its art and I am a big fan with a strong tendency to understand the science behind these visually attractive atmospheric events. 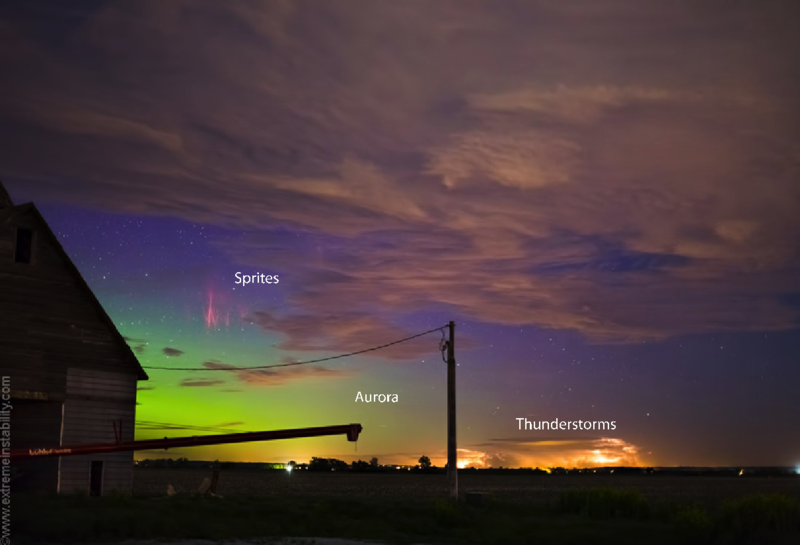 An excessively rare image capturing the aurora, red sprites, and a lightning storm in the same frame over Minnesota in May 2013 (Image Credit: stormandsky.com). Even though lightning is one of the most commonly experienced geophysical phenomena on Earth (30-100 strikes per second), only a very small fraction of lightning flashes are accompanied by sprites. Florida, the lightning capital of the world, is a good place to study sprites. Therefore, after completing my undergraduate degree, I decided to stay for graduate school and get involved with the sprite research at Geospace Physics Laboratory. I recently received my Ph.D. degree in Physics in May 2015 from Florida Institute of Technology. I joined the Aurorasaurus team in December 2015. I am excited to work with a team that brings a unique combination of professional space scientists, computer scientists, educators, and volunteers together. I am also very excited about the project and look forward to contributing to the science behind auroras. Auroras have always fascinated me with its magnificent display of lights. Specifically, I will be analyzing space weather data together with the citizen science data to improve our understanding and forecasting of the aurora. Burcu Kosar (pronounced Burr-joo) currently works at NASA’s Goddard Space Flight Center in Greenbelt, Maryland as a post-doc with Aurorasaurus. She received her B.S. in Physics, M.S. in Space Sciences, and Ph.D. in Physics all from Florida Institute of Technology. When time permits, she plays volleyball professionally and paints. Originally from Turkey, she enjoys hiking and traveling. ← We Want You…to be an Aurorasaurus ambassador!